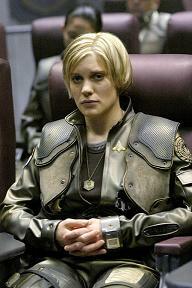 Call sign Starbuck, Kara is a Viper pilot. A loner, as undisciplined and rebellious out of the cockpit as she is calculating and precise in it, she may be the fleet's best pilot – and is constantly in trouble because she doesn't suffer fools. She is in a constant battle of wills with Colonel Paul Tigh, the ship’s Executive Officer, and she enjoys both taunting him and beating him at cards. She is Apollo’s best co-pilot, a take-charge woman who often appears around the ship in a jogging bra and shorts. Kara is a warrior spoiling for a fight, but when Adama and President Roslin agreed to flee earth, Kara had to use her battle-honed skills not to fight the enemy, but to defend the fragile nucleus of humanity carried aboard the Galactica to an unknown future.